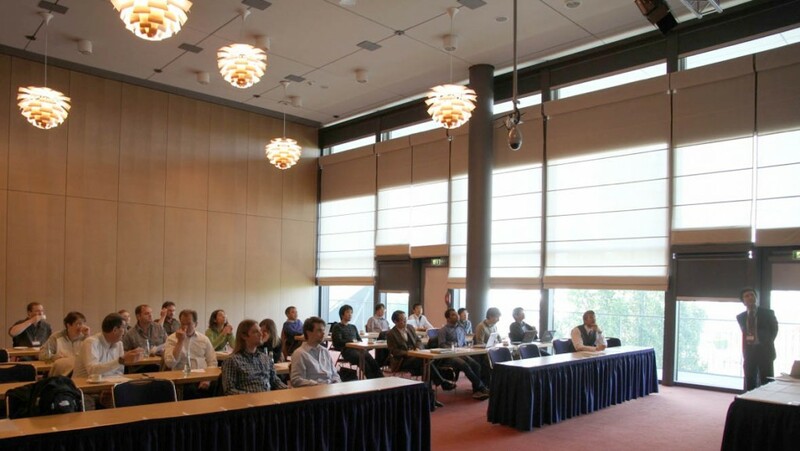 An open workshop was held on Sun 5th May 2014 in the International Congress Centre Dresden. Most members of the HARFIR project were present, along with 3 invited speakers and a few other interested parties – with total attendance of 26. We had a very fruitful discussion over the talks and excellent networking during the breaks. 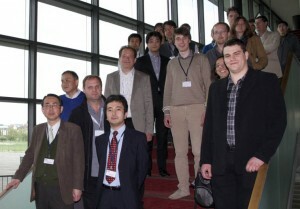 The meeting was opened at 9am by Dr Atsufumi Hirohata from the University of York who is the lead on the project. Dr Hirohata welcomed everyone and gave a brief overview of what the project entailed and how the project is structured. He introduced the day and welcomed the invited speakers and guests. The first invited speaker, Prof. Claudia Felser – a world expert in bulk Heusler materials, from the Max Plank Institute – was sadly unable to attend. She had however asked two of her colleagues from the Institute to fill in for her, so Dr Stanislav Chadov gave a talk on the measurement of compensated ferrimagnets based on Mn-rich Heusler alloys, whilst Dr Ajaya Nayak spoke about his experience with exchange bias in Mn2PtGa Heusler systems. The next two talks were from the theory partners of the HARFIR project. Prof. Laszlo Szunyogh from Budapest University discussed atomistic spin-models from first principles, whilst Prof. Uli Nowak from Konstanz University explained how he studies exchange bias using numerical calculations. These two talks gave an insight into the work being done by these two groups to develop code and search for a suitable Heusler alloy. Following the theory talks, we were returned to experimental work when one of the collaborators in Japan – Prof. Kanta Ono, from KEK – explained how his team uses synchrotron X-rays and neutrons to analyse structural and magnetic properties. This gave us a better understanding of the instruments and experiments they are able to do at the high energy facility. This was followed by a conceptual talk from Prof. Kevin O’Grady from York University on interfacial effects in exchange bias systems – raising some interesting questions about interfacial behaviour. A buffet lunch then provided a chance for all participants to get involved in further discussions. The afternoon session kicked off with a second invited talk from Dr Hiroaki Sukegawa from NIMS on spin transfer magnetisation switching and perpendicular anisotropy, with an emphasis on the ultra thin Co2FeAl Heusler alloy films he has studied. This was followed by a treatise on magnetic tunnel junctions with Heusler alloys, given by Dr Markus Meinert from Bielefeld who kindly stepped in at short notice to cover for Prof. Günter Reiss who had fallen ill. The final talk of the day was presented by Prof. Koki Takanashi from Tohoku University, who is the Japan leader on the HARFIR project. Prof Takanashi spoke about the work going on in Tohoku concerning the fabrication and characterisation of devices with Heusler alloys. Finally, the workshop was closed by Prof. Takanashi thanking everyone for a very fruitful workshop and looking forward to the next meeting. The workshop finished at 3pm to enable participants to join the opening of Intermag 2014, which was just beginning in the same venue.